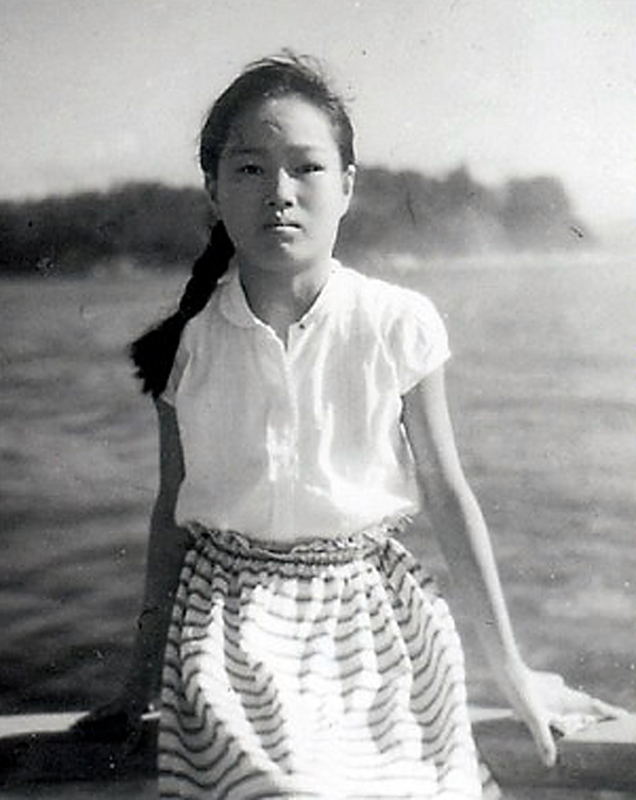 Hiroshima victim remembered with film, paper crane donation. The observance of the 71st anniversary of the Hiroshima and Nagasaki atomic bombings — Aug. 6 and 9, respectively — began early this year with the U.S. premiere of “Orizuru 2015,” a short film about Sadako Sasaki and her paper cranes. 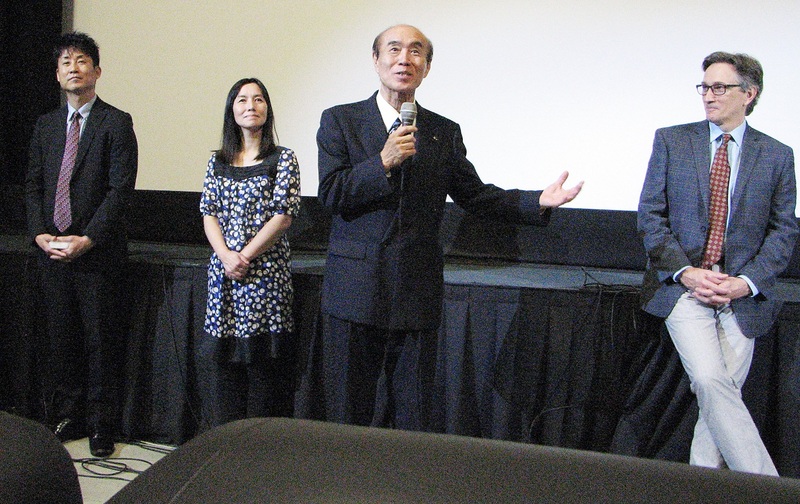 A series of screenings at the Laemmle Royal Theatre in West Los Angeles began on May 27, the day that President Obama visited Hiroshima and paid his respects at Peace Memorial Park, becoming the first sitting U.S. president to do so. Sadako survived the Hiroshima bomb but died 10 years later at age 12 due to radiation exposure. While in the hospital, she set out to fold 1,000 origami cranes in the hope that her life would be prolonged. Although her wish didn’t come true, she and the paper cranes (orizuru) became symbols of peace. In the film, 5th-grader Satoshi (played by director Miyuki Sohara’s son, Takamaro) helps Richard (Jed Mills), a Pearl Harbor survivor, to make paper cranes for a peace ceremony in Hawaii. In the process, Satoshi learns about the story of Sadako (played by Sohara’s daughter, Reyna) and meets Sadako’s older brother, Masahiro (Toshi Toda). 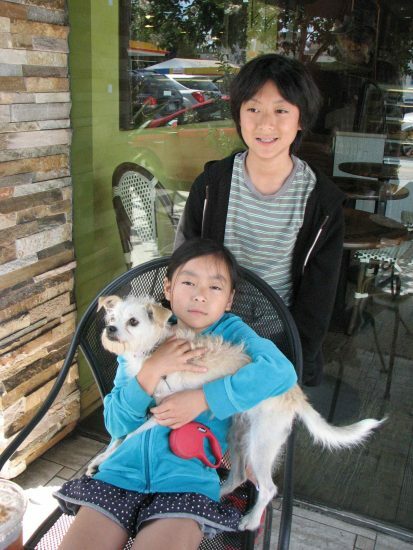 Singer/songwriter Yuji Sasaki, Masahiro’s son, appears as himself. 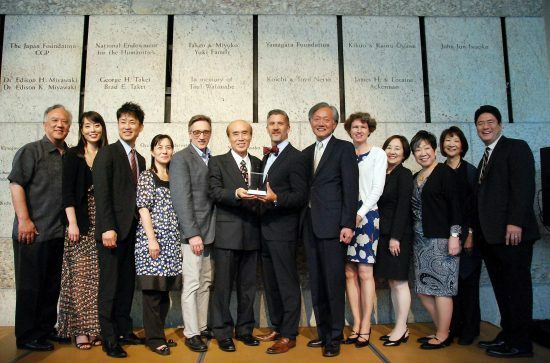 During the run of the film, members of Sadako’s family and a grandson of President Harry Truman, who made the decision to use the A-bomb, appeared at screenings and visited the Museum of Tolerance and the Japanese American National Museum, presenting one of Sadako’s cranes to each. At the May 29 screening, both Sohara and then-Consul General Harry Horinouchi said they were pleased that Obama visited Hiroshima and that he gave two origami cranes that he had folded himself to the Peace Memorial Museum. “Through this film, I wish that the movement for world peace will spread and continue for future generations,” said Sohara, who also plays Satoshi’s mom in the movie. Horinouchi added that many people have been inspired by Sadako’s story. She was “very inspired” when a group of elementary school students in Los Alamos, N.M., where the A-bomb was created, collected money to make a peace monument. 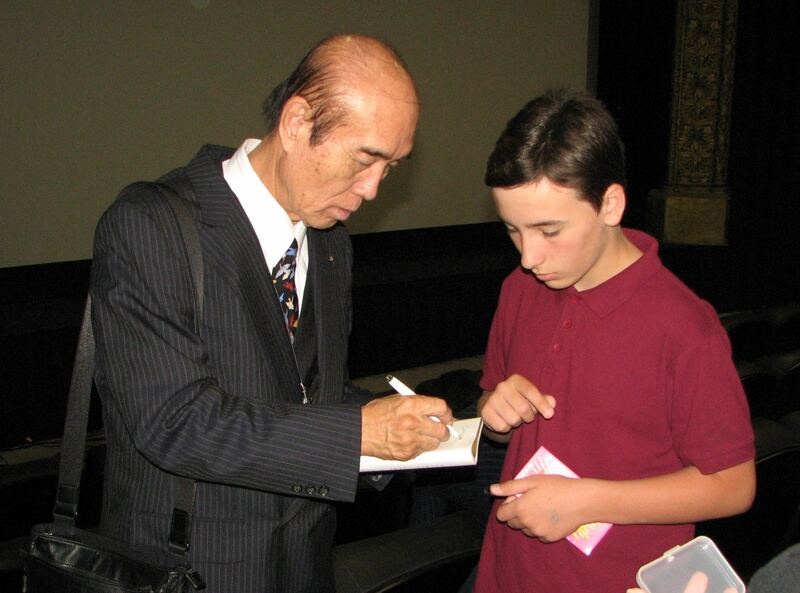 Sohara visited schools in Los Angeles, Torrance and Santa Monica, addressing almost 1,000 students. The film has received a Spirit Award from the National Council for Social Studies and Sohara has been invited to address a gathering of social studies teachers next year in San Diego. He said his wish is that the film will convey Sadako’s “omoiyari” spirit and spread the message of peace little by little. “Sadako’s story was the first human story of Hiroshima or Nagasaki that I ever read,” said Clifton Truman Daniel. “Up to that point, my grandfather never spoke to me about the bombings. I was very young and it was a tough subject, and to keep our lives normal my family downplayed our relationship to Harry Truman … I learned about the bombings from my history books, from my teachers. There was a page or a page and a half, a picture of the mushroom cloud, facts and figures, but nothing about what happened to the people on the ground. “I mentioned this to a couple of Japanese journalists who were doing stories on anniversaries of the bombings, and those stories eventually got back to Japan and got to Masahiro. And he called me out of the blue one day and just said, ‘I understand you read my sister’s story and you read it to your son. Could we meet someday, maybe work together?’ I said yes. One of Sadako Sasaki’s cranes was donated to the Japanese American National Museum during the opening reception for “Above the Fold” on May 29. From left: Gene Kanamori and Nikki Kodama JANM governors; Yuji Sasaki, Sadako’s nephew; Miyuki Sohara, producer/director/writer of “Orizuru 2015”; Clifton Truman Daniel, grandson of President Harry Truman; Masahiro Sasaki, Sadako’s brother; JANM President and CEO Greg Kimura; Consul General Harry Horinouchi and his wife, Sabine; Kathryn Bannai, JANM trustee; Tracey Doi and Mitchell Maki, JANM governors. “We met in New York at the World Trade Center Memorial, where Masahiro and Yuji were donating one of Sadako’s last cranes as a gesture of healing. 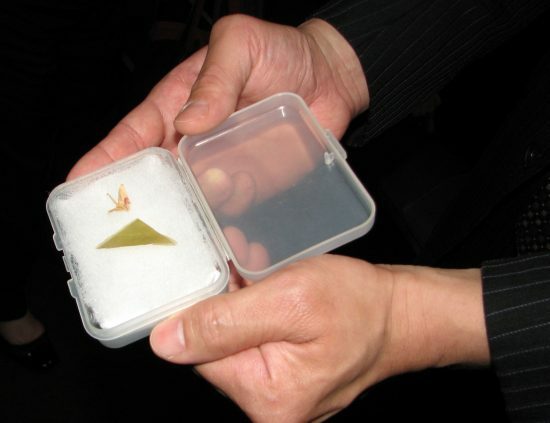 During that meeting, Yuji placed a tiny paper crane in my palm and said, ‘That’s the last one that my Aunt Sadako folded before she died.’ At that point he and his father asked if I would attend memorial ceremonies in Hiroshima and Nagasaki. “When we were in Japan in 2012, there were signs about this,” Daniel said. “The ambassador at that time, Ambassador (John) Roos, had been to Hiroshima the year before and I think the year before that. But the year that we went there was the first year that Ambassador Roos went to both ceremonies, both Hiroshima and Nagasaki. “The survivors in Nagasaki particularly asked me if I would write a letter to Obama urging him to visit Hiroshima and Nagasaki, and I did write the president a letter, but urging him to first speak to survivors living in or close to the U.S. so that he could hear the stories first. I thought it would be difficult to get a sitting U.S. president to Hiroshima or Nagasaki. Sohara noted that the orizuru used in the movie totaled 3,800 and were donated by many people in Japan, Southern California, and New York, the latter from child cast members of the Broadway musical “The King and I.” A thousand of those cranes were donated to Peace Memorial Park. Sohara pointed out that the presentation of Sadako’s crane to JANM — at the opening reception for its exhibition “Above the Fold: New Expressions in Origami” that evening — coincided with her birthday and that of Eleanor Coerr (1922-2010), author of “Sadako and the Thousand Paper Cranes,” which has been translated into more than a dozen languages. “One of the reasons I asked the Sasaki family to get permission to make the movie is because Eleanor Coerr has passed, but I feel that because we were born on the same day … I felt the mission to continue what she has started,” Sohara said. The cranes have taken on a wider meaning of friendship and caring, Sohara added, noting that both orizuru and donations were sent to victims of the 2011 tsunami in Japan’s Tohoku region and are currently being collected for survivors of the earthquakes in Kyushu. For more information on “Above the Fold,” which closes Aug. 21, visit www.janm.org. For information on the film, visit www.orizuru2015.com.